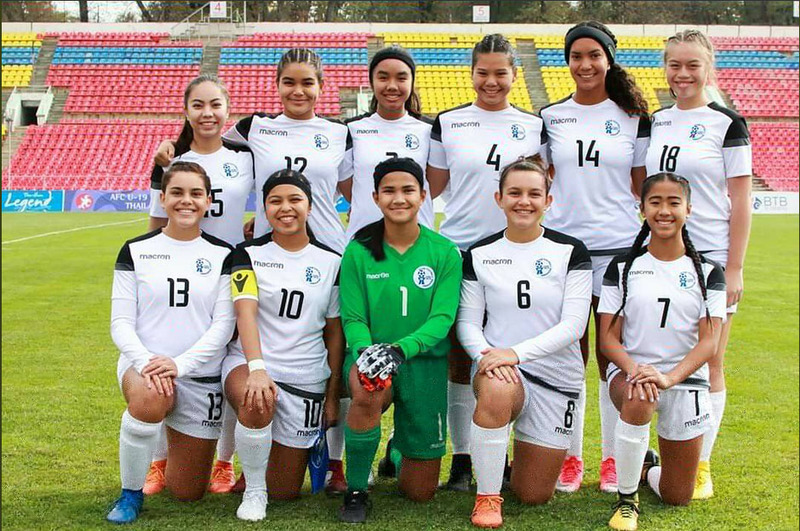 PRESS RELEASE – The Young Masakåda, Guam U19 Women’s National Team, opened its bid in the AFC U19 Women’s Championship Qualifier with a strong 12-0 win over the Maldives at the Dolen Omurzakov Stadium in Bishkek, Kyrgyz Republic. Guam’s Ysabella Vasquez gets through two Maldives defenders during an opening day match of the AFC U19 Women’s Championship Qualifier Group C at the Dolen Omurzakov Stadium in Bishkek, Kyrgyz Republic Saturday. The Young Masakåda, Guam U19 Women’s National Team, defeated the Maldives 12-0 in Asia’s first match of the tournament’s qualifying round. Photo courtesy of Football Federation of Kyrgyz Republic. Hannah Cruz and Lauren Phillips led all scorers with a hat trick each in the win. Isabella Bass, Sabrina Kenney, Isa Whalen, Rylee Guzman, and Ysabella Vasquez also put their names on the official score sheet with one goal each. Guam’s other goal came on a Maldives own goal in the 62nd minute. Each link provided has the option to save the date on your device’s calendar.